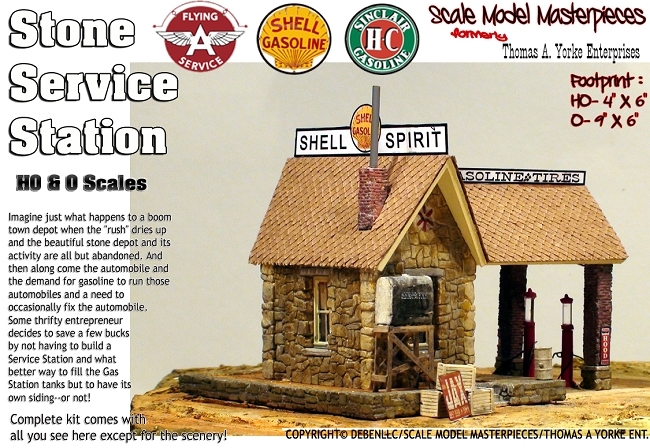 The STONE SERVICE STATION Kit Free Shipping through Mother's Day! 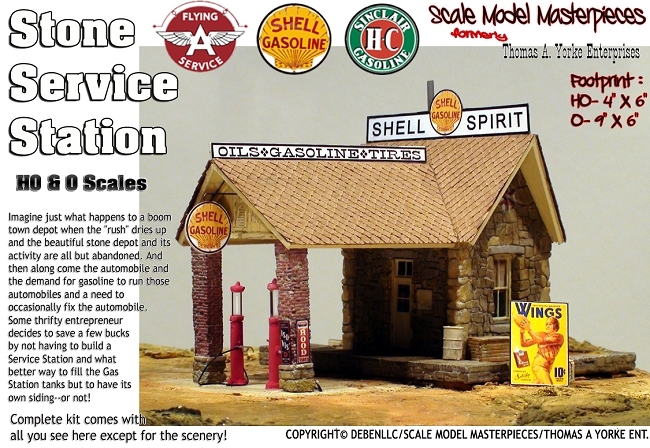 Imagine just what happens to a boom town depot when the "rush" dries up and the beautiful stone depot and its activity are all but abandoned. 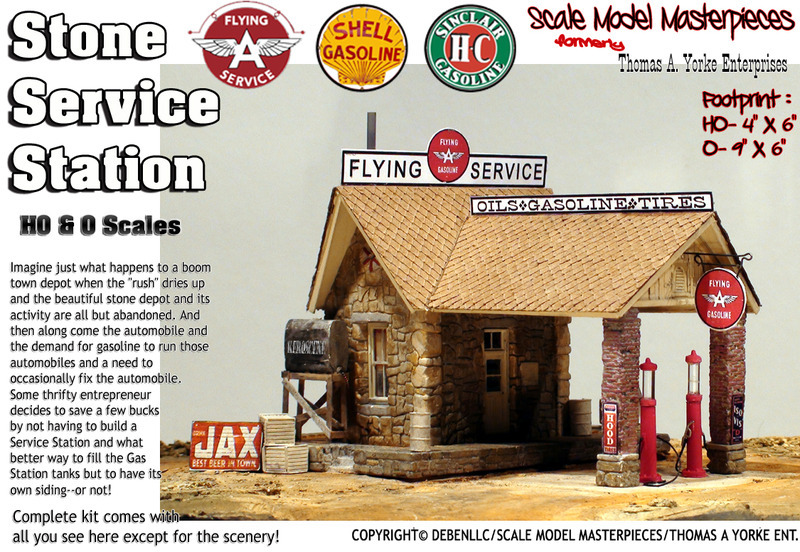 And then along come the automobile and the demand for gasoline to run those automobiles and a need to occasionally fix the automobile. 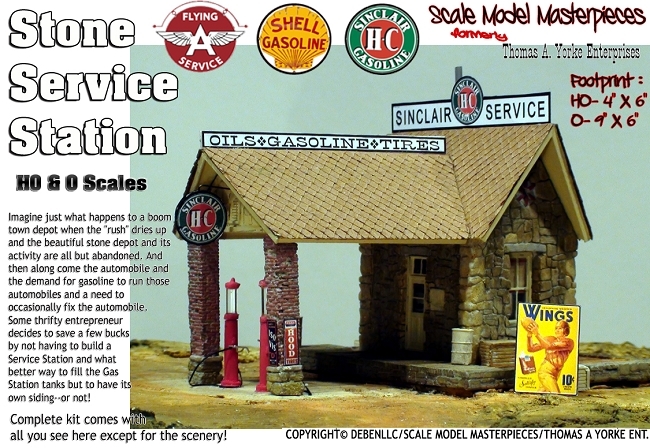 Some thrifty entrepreneur decides to save a few bucks by not having to build a Service Station and what better way to fill the Gas Station tanks but to have its own siding--or not! 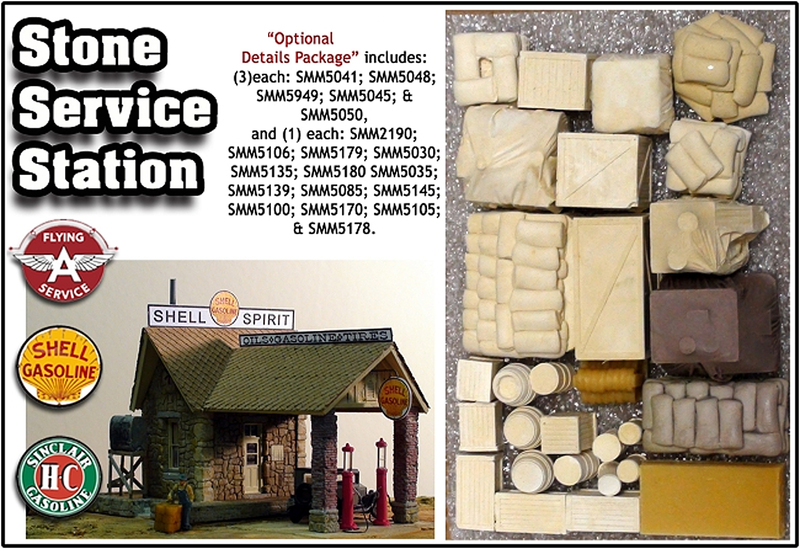 This amazing kit comes with the *original* beautifully detailed Thomas A. Yorke Ent. castings of stone, wood, and brick. 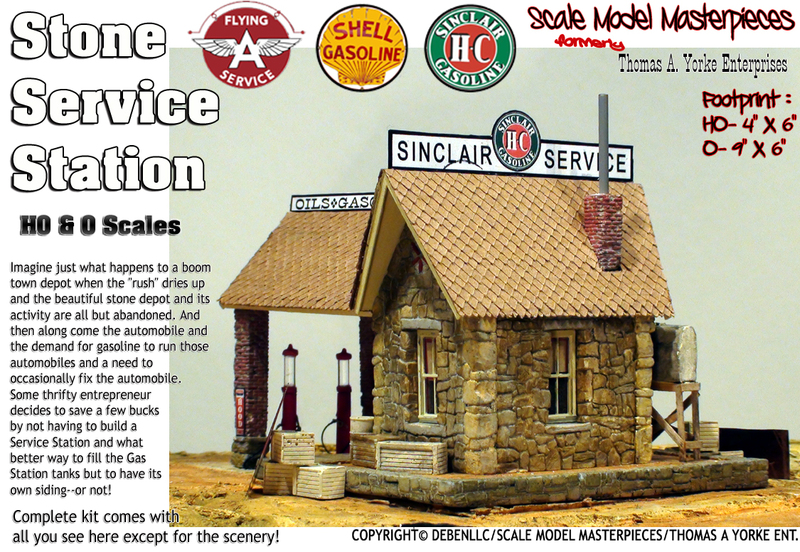 This kit was first offered in the 1980s as the "Short Line Stone Depot" (#SMM3108) and the construction, staining, and weathering instructions have been updated to currently available products including easy to learn techniques in our Doctor Ben's How-To #2: "The ABC's of Staining Castings" booklet/instructional. 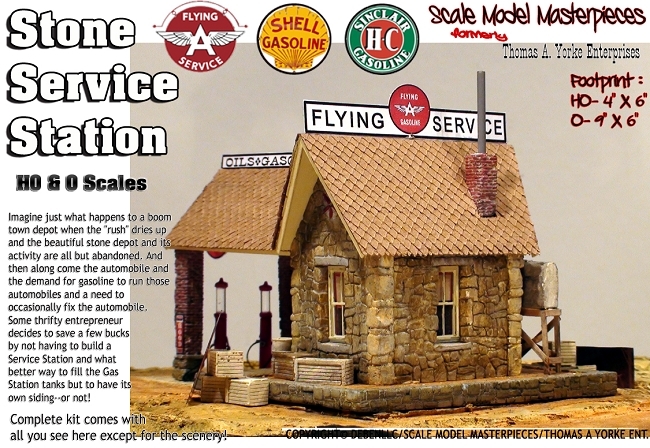 This kit includes: Color Photos, LabStone castings from original Thomas A. Yorke Ent. 1980s meticulously hand-carved master patterns, Kappler Scale Lumber, Grant Line windows, doors & roof detail, original detail castings (+more), 4-Color signs, updated construction and weathering instructions described in our Doctor Ben's "The ABC's of Staining Castings" for create a prize winning model. Above right and at top are the Pilot Model construction & completed images of this finished model. Instructions are 4-color LASER printed and included is a color image! 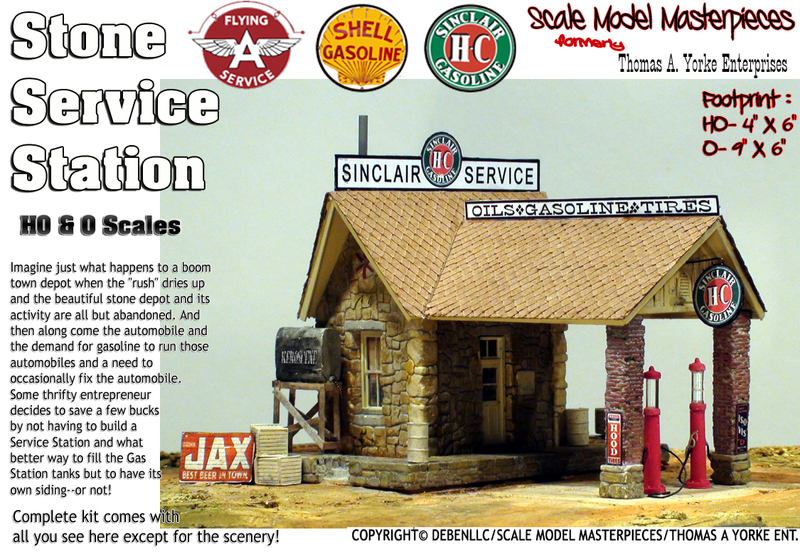 This is a great kit with lots of character and detail. 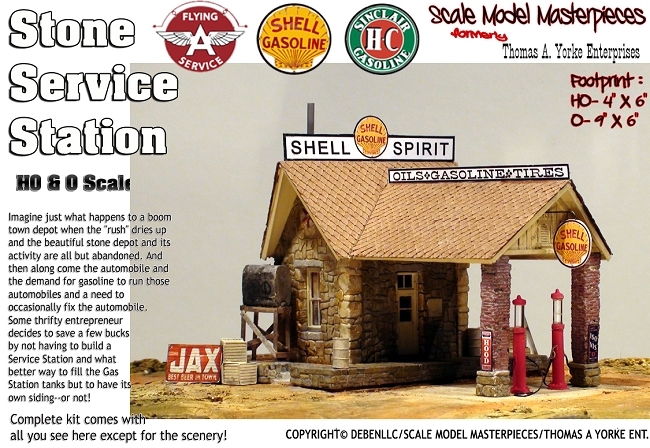 Also included in this kit are the following Scale Model Masterpieces Details: Gas Pump Set (1) #5409, Small crates (3) #5050, Medium crates (3) #5045, Barrels (3) #5041, & (1) Fuel oil tank on stand kit #5266. Yeah, I know; that's a lot of details, right? Options, options, options! What else can we do? How about an Extra detail casting (23pcs) set for $12.89? 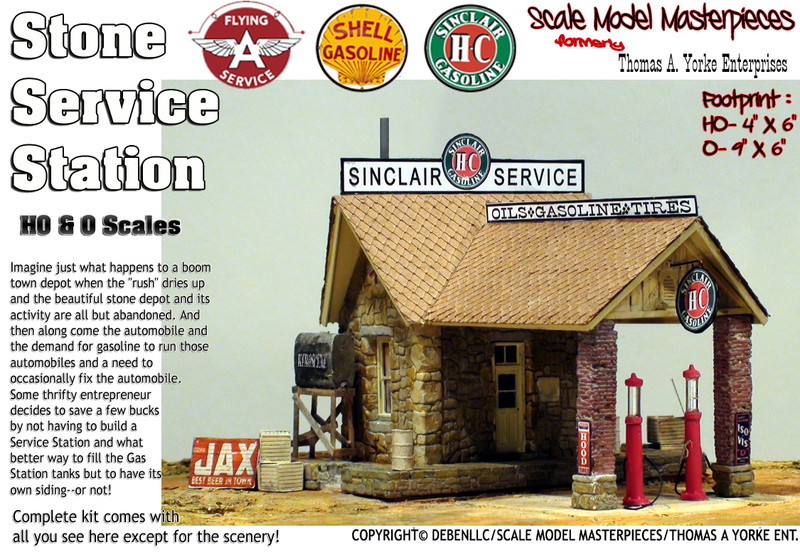 The #3109 HO Scale “Optional Details Package” includes: (3) each: SMM5041; SMM5048; SMM5949; SMM5045; & SMM5050, and (1) each: SMM2190; SMM5106; SMM5179; SMM5030; SMM5135; SMM5180 SMM5035; SMM5139; SMM5085; SMM5145; SMM5100; SMM5170; SMM5105; & SMM5178. NOTE: All of the structure castings for this model are made from "original" Thomas A. Yorke molds/masters and cast in Labstone/Dental (Buff) for much more superior detail than casting made of Hydrocal© can produce.